This is an optional RECON event. Any teams that are available are encouraged to participate! You should configure VirtualDub to save your files sequentially by using “Set Capture File” to save as C:/Users/RECON/Data/20160626/20160626_01. You should record the filenames and information about each file using the RECON Observation Logsheet. See RECON Event Detail Page for Quaoar for finder chart provided by Marc Buie. Note that north is up in this automatically generated chart. The green rectangle represents the field of view of a standard RECON system, although the orientation of the rectangle does not match the orientation of the field at the time of the event. Marc will work on upgrading this feature in the future. 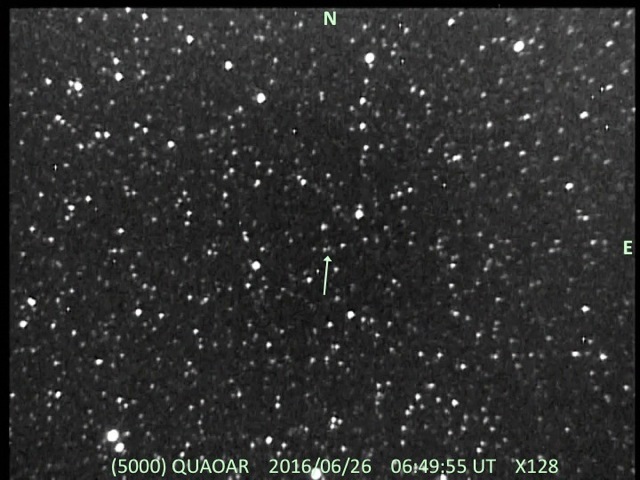 Below is an image of the star field provided by Bill Gimple from Greenville. As you can see, this is a very crowded field. We recommend use of the star training set to confirm the pointing of your telescope to aid you in getting to the right field. If you do participate in this optional event, we need you to Report Your Observations. This includes completing an Post-Event Report, saving an electronic version of your log sheet, and uploading both videos and observation log to SwRI in Boulder.